David did not realise that he had suffered from undiagnosed dyspraxia and dysgraphia all his life. Over the years, he had thad seven attempts at trying to pass his finals to become a qualified accountant. He had always been on the lowest rate of pay since leaving school and couldn't move from his one and only position in the workplace. He felt trapped. 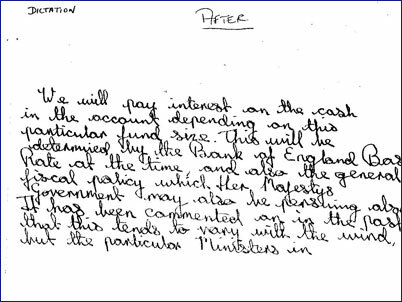 His 'Before' sample shows his illegible handwriting style of joined capital letters. He was unable to write or recall his small case letters. 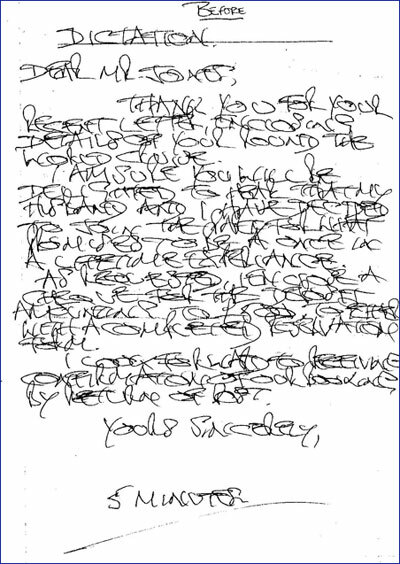 His 'After' sample, one week later, shows his newly developed prescriptive, handwriting style, a style that enabled his examination papers to be read; six weeks later he took his finals once more without the distraction of hand cramp. David was thrilled to receive a letter saying he had, at last, passed his finals..